It’s the Queen’s Diamond Jubilee long holiday weekend. I haven’t got an ideal post for celebrating it – I don’t really write about copying the Queen’s style 😀 Not many patterns for a sheath dress with matching coat. (Saturday she wore her usual coat with pleated ruffle round neck and front edge, attractive and current.) This can be a more interesting look than a suit, especially for a petite. So perhaps start from New Look 6163. Leave off the band collar for a more classic effect. And she always shines in her ‘Spring’ Colours. Good Luck to her anyway. I could just go on as usual, and post more comments on Judith Rasband’s summer capsule. Or write about my current obsession – getting basic blocks to fit – which I plan to spend the weekend doing. I’ve chosen instead to post the first of some pieces on relaxed clothes – suitable for a switch-off and laze weekend. This post is inspired by The Vivienne Files. Usually I enjoy looking at the ideas there but would never copy them for myself. All those close fitting tees, leggings, short skirts and sheath dresses – not my style at all. But she (Janice) recently suggested a some loose casuals which I could happily wear. All clothes from L. L. Bean. In fact I got so inspired by this it has turned into 4 pieces – this on patterns for her basic wardrobe, another on accessories and layers, yet more on big jackets for wearing over loose casual tops, and some comments on simple wardrobe plans. 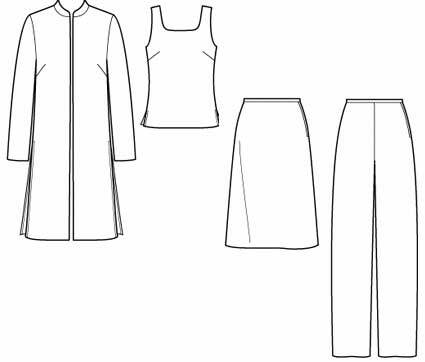 Janice talks about building a wardrobe in groups of 4 items, and starts with 2 tops, 2 bottoms. Sleeveless and sleeved tops, gathered waist skirt and capris. Everything in the same accent colour. An interesting idea if you like strong colour in summer. But not essential! Don’t let the colour put you off considering this approach to wardrobe building 😀 Personally I prefer variants around a colour rather than everything exactly the same, and I rarely wear accents. A bit like Kate Mathews’ ideas for a 6-yard wardrobe, in her oop book ‘Sewing a Travel Wardrobe‘. She uses a jacket, dress, skirt and pants all made in the same fabric, as the core of a travel wardrobe. Or follow the trendy colour blocking idea, and make each garment in a different strong colour – red, green, aqua, blue, orange, yellow, chartreuse, purple. True basics, with minimum style elements – co-ordinate easily with almost any other relaxed loose fit styles. Easy to reproduce using Cutting Line Designs. Looking closely at the photo in the red group, this might be a boat neck raglan top, like a classic sweat shirt. See my post on patterns for sweatshirts and relaxed tees. Janice then adds 4 to the initial group, 2 more tops, 2 more bottoms. Tee, knit cardigan for layering, shorts and pants. For colour this time she uses a simple medium-light or medium neutral. For the top, use your favourite tee pattern. If you’re looking for a starter tee pattern, find one with the right level of ease for you. Do you prefer loose fitting knits ? knits which are the same size as your body ? knits with negative ease, that stretch over and emphasise your shape ? Skin fit knits are ‘modern classic’ but may not be your style. Carefully check illustrations of the effect. Best to measure a knit pattern before cutting out, so you don’t get too-big/ too-small surprises. Plus Janice’s second group includes a classic button up cardigan in a textured knit, perhaps chosen from Butterick 5760. 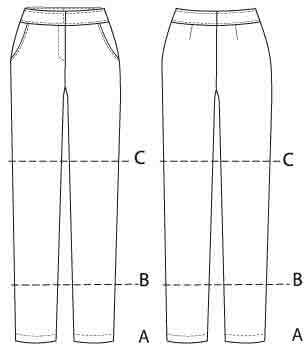 Pants with waistband, fly, slant pockets – shorts and full length. 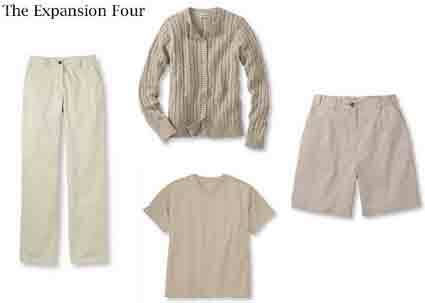 Palmer-Pletsch have a pattern for chinos, McCall’s 6361. 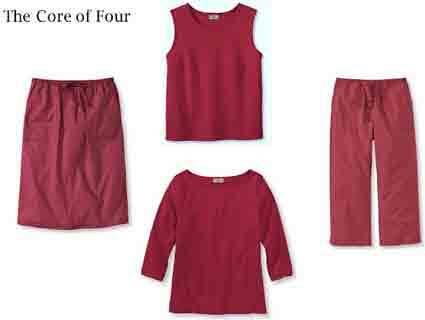 Finally Janice adds 4 more tops – a variety of ‘casual classics’. Using fabrics which bring together the colours. Here she adds white (use your lightest neutral). – accent-medium neutral-light neutral plaid. Make a big change to the style of the wardrobe by using prints instead of straight line weaves. This season’s print possibilities : underwater aquas, paisley, Afro, pretty florals, or techno prints that could only come from a computer. Or introduce a current fabrication : sheer, satin, metallic. Prints for jackets and pants as well as tops this season. 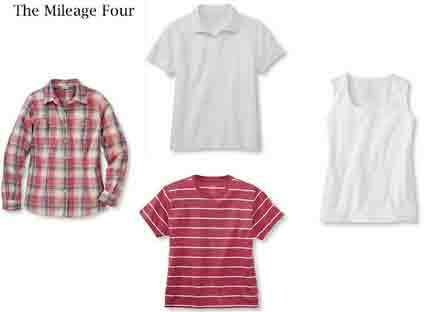 For garment patterns, repeat your favourite shell and tee. Silhouette Patterns 225 Sarah’s Top has B, C, D cup sizes. Well, only if you like polo tops of course. For some reason I feel ‘no never’ about them – too many associations with high-school sports perhaps 😀 Though I do like a lowest layer with a collar. So I would replace the ‘polo’ top with a collared blouse in a woven. 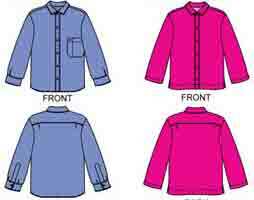 Big shirt which can be worn alone or layered – many possible patterns, even a men’s shirt. There’s the shirt in Butterick 5760 mentioned before. Or a new big shirt from them, Butterick 5773. 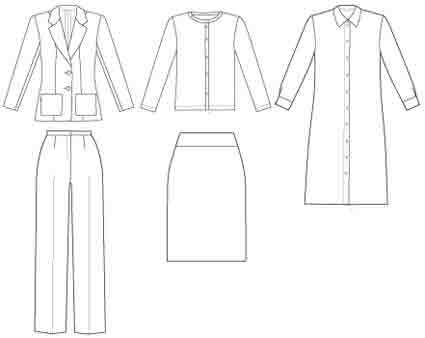 Or, staying with Cutting Line patterns, use The Blouse Perfected. Louise Cutting also has a ‘big shirt’ pattern coming out this summer. I like the big shirts from Rag Merchant, which have softer corners and some added ‘crafter’ design interest. Here’s their Back Country Shirt. Janice is always good on accessories. But this post has got very long, so I’m putting them in a later post. And relate your choices to your own tastes and needs. Even in summer here I usually need an added layer. It’s the ‘essential fifth’ for me – the initial core 4 plus layer. So I’ll suggest a range of jackets for a different look to these relaxed basics. Or perhaps like the Queen you prefer tweeds and a Barbour when not on show. This entry was posted on June 2, 2012 at 7:45 am and is filed under specific capsules, wardrobe planning. You can subscribe via RSS 2.0 feed to this post's comments. Both comments and pings are currently closed. I find her “pod” system very inspiring, and I really like the combo she posted on May 18 of Navy and aqua. These are the types of colors I gravitate toward in summer. However, when you sew, one of the main difficulties is finding the right fabric, and I have no aqua bottomweight fabric in my stash and haven’t seen any in the shops here. I really love the print in the J crew skirt. What’s missing for me in the selections she makes would be a very lightweight, long sleeved top to protect my pale skin from the sun while staying cool. The shirt has narrow sleeves that might not be very comfortable in high heat. 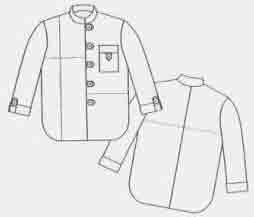 Do you have an idea for a pattern with loose sleeves but with buttons up front, which would make it most practical as an overlayer? Or I’m thinking maybe some kind of cape, made out of cotton voile or linen might work. Sara – yes, loose coverage is what many need in bright sunshine. Would Butterick 5355 be right for you – add front opening and leave off the sash. Or a short but light and breezy caftan, perhaps McCall’s 5855 or oop McCall’s 6125. This season Eileen Fisher has several gauzy cropped ponchos as a light layer. I’m planning to mention them in my post on layers to add to these basics. Thanks for your suggestions! The Eileen Fisher top is wonderful. A simple rectangle, but it drapes beautifully. She makes it out of jersey. I wonder if it would work in a soft woven. The Butterick blouse is very nice. I like the shape of the sleeves. This is BRILLIANT! I’m so happy that you were able to build upon my ideas to personalize them to suit you; that’s really my goal. I naturally gravitate to sleek, narrow, un-ornamented styles, because they suit me best, but my ultimate desire is to show guidelines, not dictates. Thanks Janice 😀 I’m not ‘sleek’ in shape or personality but I do greatly enjoy looking at your blog – much food for thought ! Nothing easier.. http://themahoganystylist.blogspot.com/ is a member of the local sewing guild who seems to take on quite a few client commissions and does great work. If she can’t accomodate you personally, I’m sure she’d know half a dozen very competent seamstresses who could do anything you’d think of. I really like these ideas–so thanks to you and Janice. My style is a “core three”–pants, top, jacket. I don’t wear skirts. But it is interesting to see what combinations to make out of those three elements. Since I’m trying to move away from structured jackets (I just retired,) I like the idea of using a big shirt as a kind of jacket–it then could also be used as a top on its own. Yes Lynn, I think many of us like a ‘Core 3’. I’m planning to talk about different cores soon, in a post on wardrobe building inspired by Janice’s ideas. I never wear skirts either :-). But I like the idea of a short-sleeved and a long-sleeved option in a core group.. Plus sewingplum likes a third layer, and I think she’s right that the right cardigan or vest can very much extend a capsule’s usefulness. Lisanne, I can’t think why I haven’t been reading your blog recently lately as I always enjoy it so. Anyway more for me to enjoy now. Thanks for this post!